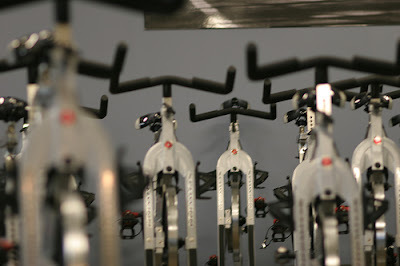 Last month, I started spinning classes at East Hills. Basically its a high-calorie burning aerobic exercise. I wasn't sure what to expect (other than what I've heard), but it really got me sweating. Its nice exercising in a class format, as the leader helps encourage and motivate you to give it your all. And its easy to get into routines, so this helps add a little excitement. Now my heart and legs are stronger than before, as I have better stamina and a lower heart-rate while in class. It's only two hours a week but I am going to start working an additional day on the rollers in my apartment.